Christmas approaches, and the reckoning begins. Have these pets been nice or naughty? Only one man can judge them. 1. "Even when I'm sleeping??" 2. "Let's see how far away from Santa I can get while still being in the photo." 3. Literally no one looks happy to be here. 4. "OMG ARE THOSE CANDY CANES?" 5. "I can't believe we wore the same hat. How embarrassing." 6. "He said I'm a good boy!" 7. Halloween is more their speed. 8. "I knew you were real. I knew it." 9. Like a reindeer caught in the headlights. 10. Someone is getting coal in their stocking this year. 11. Hey, Santa, your polar bear is melting. 12. "You expect me to believe that this is the real Santa Claus? Please." 13. "I've been the goodest of good dogs, I promise." 14. Santa's beard looks fluffier than usual. 15. "You've got ten seconds to take the photo before I bolt." 16. "Last year's Santa was way better." 17. "This chair is cozy as heck. How about I get one of these for Christmas?" 18. "I get to meet Santa AND wear this cool hat? Score!" 19. "Listen, Santa, I'm as confused by this as you are." 20. "You smell like cookies!" 21. "Is this guy licensed?" 22. "My revenge will be swift and merciless." 23. Happy holidays, or whatever. 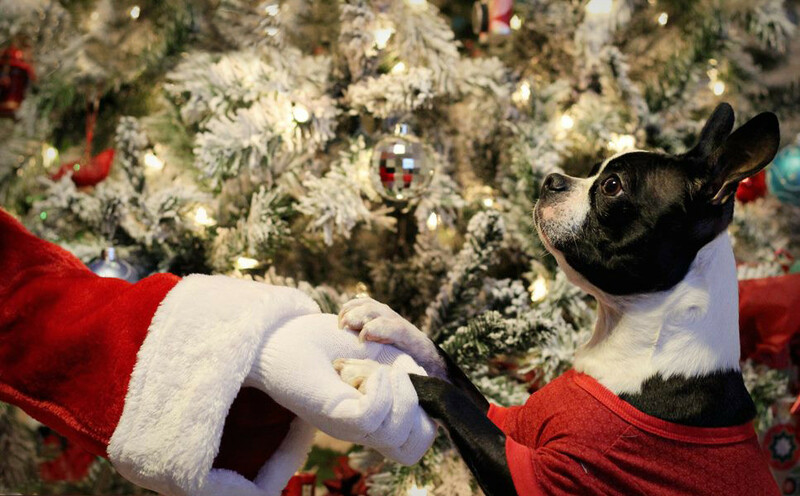 It's time for more hilarious photos of pets during the holidays. Start with this gallery of pets who are meh about Santa and then scroll through this list of 20 clues that cats invented Christmas.